The Abia state governor, Okezie Ikpeazu, personally delivered the shoes to Obasanjo at his home in Ogun state yesterday. 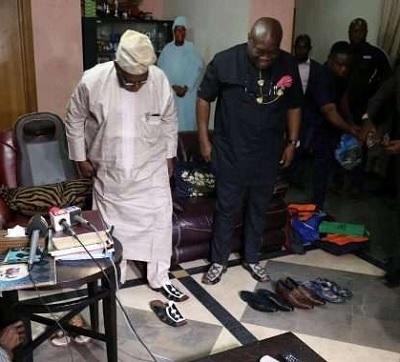 The former President was at a function in Lagos some weeks back and ordered some Made in Aba shoes. Obasanjo made the order through the Chief Marketing Officer of Made-in-Aba Product, Governor Okezie Ikpeazu during the 2016 Tony Elumelu Entrepreneurship Forum in Lagos. While making his speech at the event, the Abia State Governor stated that Aba remains the Small and Medium Enterprises (SMEs) capital of Nigeria, where young Nigerians were engaged in the business of making of shoes, clothing and other products. Controversy and confusion have continued to trail the Appeal Court judgment on the Abia State governorship crisis. The appellate court ruled that the parties, Governor Okezie Ikpeazu and Dr Uche Ogah should maintain the status quo pending the determination of the earlier suit challenging Ikpeazu’s removal from office. 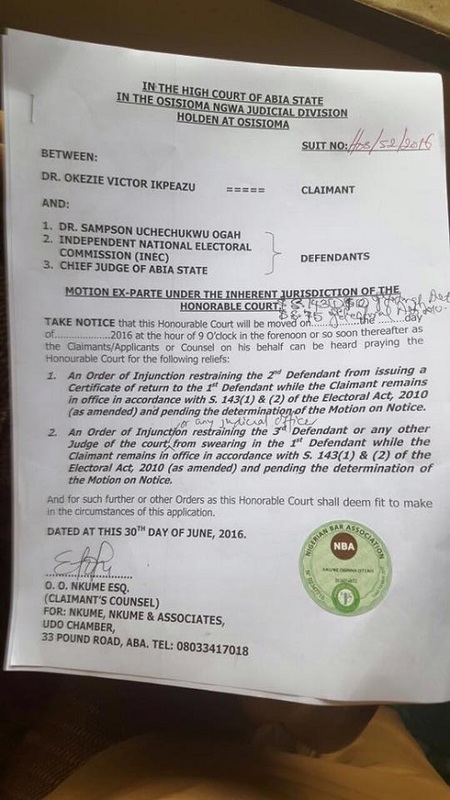 Some lawyers have argued that the judgment by the appellate court sitting in Abuja had created more confusion since no stay-of-execution order was issued, even as Ogah has his Certificate of Return as issued by the Independent National Electoral Commission (INEC) which impliedly supersedes the one earlier issued to Ikpeazu. The lawyers submitted that Ogah could still go ahead to enforce the Abuja High Court judgment as the appellate court has expressly stated that the lower court’s order had not been vacated. But Kevin Godwin Abonyi of Oseloka Osigwe Chambers, Nnewi, Anambra State, said what was important to determine was the prayer of the appellant. He, however, said based on media report concerning the Appeal Court judgment on the matter, Ikpeazu should remain the governor of Abia State. “What I infer from this judgment is that the parties should maintain the status quo. It means every action should be on hold including the swearing in of Uche Ogah. It does not matter whether the panel of judges expressly stated this or not. “Ogah should not go ahead to fight for his swearing in even though the Federal High Court, Abuja order still subsists,” Abonyi submitted. Lawyers against the judgment, however, maintained that Ikpeazu was governing Abia State without a valid Certificate of Return and insisted that Ogah must be sworn in since there was no stay of execution order issued by the appellate court. A five-member panel of judges, led by Morenike Ogunwumiju, said the parties in the matter must “remain as they were” before the case got to the court. She said the ruling did not mean a stay-of-execution order. A Federal High Court had on June 27 nullified Mr. Ikpeazu’s election after finding him guilty of tax offences. The court, presided by Okon Abang ordered INEC to issue Samson Ogah a certificate of return. On Tuesday, counsel to Mr. Ogah argued that Mr. Ikpeazu was not legally occupying the Abia State house. He said there were conflicting judgments on the matter. But the judge, Mrs. Ogunwumiju, said the court considered it important to avoid a misinterpretation of its ruling. She said the decision of the court that parties to “remain as they were” should not be misconstrued as meaning that the appellate court had issued a stay-of-execution order. 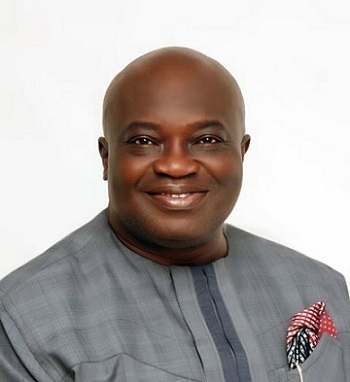 The uncertainty of Abia State gubernatorial judicial hullabaloo continues as Abuja Federal High Court on Friday refused to hear the application for stay of execution brought before it by the embattled Abia State Governor, Okezie Ikpeazu. Recall that the Justice Abang-led court had recently sacked Ikpeazu as governor of the state over tax evasion. The judge had also ordered the Independent Electoral Commission, INEC, to issue Ogah with certificate of return which was done. Following the court’s ruling, Ikpeazu filed for stay of execution seeking the court to set aside its earlier decision. Ruling on the suit was initially fixed for Thursday 4th July, 2016 by the court but the public holiday stalled the matter from holding which was deferred till today. Meanwhile, The embattled Abia State Governor, Okezie Ikpeazu has secured a fresh motion for extension of an order restraining the Chief Judge of Abia State, the President Abia State Customary Court of Appeal and any other judicial officer from swearing in Mr. Uche Ogah, as governor of the state. The court granted his prayers to extends the swearing in to 18th July, 2016. The embattled Abia State Governor, Okezie Ikpeazu has secured a fresh motion for extension of an order restraining the Chief Judge of Abia State, the President Abia State Customary Court of Appeal and any other judicial officer from swearing in Mr. Uche Ogah, as governor of the state. Abia State Conundrum: The Limit of Executive Arrogance, By Barr. Ibrahim Lawal. It is no longer news that the political situation in Abia State had thrown up two governors. One is the defacto, the other dejure. It is also note worthy that both sides of the divides had thrown up issues albeit from the sublime to the extreme to justify their rights to the leadership of the state . The crisis of confidence arose from the challenge by Mr. Uche Ogar of the eligibility of Governor Ikpeazu to stand as the Candidate of the PDP. His main grouse is that Ikpeazu by virtue of INEC declaration is not qualified to contest because of his failure to pay his tax as at when due. Ogar's contention was that the three years tax certificate provided by Ikpeazu was issued in a day. The matter was fought from the Federal High Court up to the Supreme Court. I was present at the Supreme Court when this suit was eventually decided. Dr. Alex Iziyon SAN appeared for Ogar while Mr. Oladipo Olasope and myself appeared for INEC. The Supreme Court while upholding Ogar's appeal lampooned INEC as the real harbinger of the needless trouble as they should have exercise their power by doing the needful. In the word of the Supreme Court, it is unfathomable to discover that a candidate who wants to be a governor could not pay his tax as and when due. The Supreme Court agreed with the learned SAN contention that from the exhibit before them, it was clear that the three years tax certificate was procured in one day. What is more, the serial number of the certificates followed one another. The Supreme Court therefore, returned the suit back to the trial court for retrial. One would have expected Governor Ikpeazu to have sought for political solution to the issue having read the body language of the apex court. Governor Ikpeazu should have sit down with Ogar for some sort of political solution by way of agreement and compromises. The Governor should have come down from his high horse to ensure that Ogar withdraw the case from the court. I also learnt that in an attempt to frustrate the effort of Ogar to reap the fruit of his labour, the Abia State PDP had expelled him from the party. This to my mind is a sheer waste of time as the PDP had traversed the wrong road in 2007 when Ifeanyi Ararume was treated in the same way and the court nullified his expulsion in Ararume v. INEC &2 Ors (2007) 9NWLR (Pt. 1038) pg. 1277. It is also laughable reading some publications laying Abia crisis at the door step of the APC. It is a lazy attempt to explain a failure by the PDP to arrest the ugly situation when occasion demands. The resort to declaration of two day public holiday, black market injunction and filing of stay of execition of judgment is a mere postponement of the dooms day. The reality is that Governor Ikpeazu actually shot himself in the leg by his failure to act when it is necessary. This is a lesson for those who think power is everything, a stitch in time they say saves nine. Ibrahim Lawal is a legal practitioner based in Ibadan. Premium Times - The political confusion over who is the rightful governor of the South-east state of Abia will endure at least until Thursday, when the Federal High Court, Abuja, will give its ruling on the stay-of-execution order filed by embattled Okezie Ikpeazu. The court on Monday fixed July 7 to rule on the application filed by Mr. Ikpeazu, whose election was annulled and certificate of return withdrawn. Mr. Ikpeazu filed the stay-of-execution application days after the court sacked him from office for failing to pay his personal income tax as at when due. Hearing the application on Monday, Justice Okong Abang declined to set aside his judgment, saying he would hear other applications on the matter on Thursday. The counsel to Mr. Ikpeazu, Wole Olanikpekun, had asked the court to set aside the earlier order for a certificate of return to be given to Mr. Ogah. But counsel to Mr. Ogah, Alex Izinyon, filed a counter-affidavit against Mr. Ikpeazu’s application for stay of execution. Mr. Olanipekun then asked for time to look into the details of Mr. Izinyon’s argument in the counter-affidavit. He also prayed the court to treat the matter without delay. Justice Abang then fixed the next working day, July 7, to hear the application and other applications in the matter. The Federal Government has fixed Tuesday July 5 and Wednesday July 6 as public holidays so Nigerian muslims can join their counterparts around the world for end-of-Ramadan festivities. July 7 is the next working day in the country. Justice Abang had on June 27 sacked Mr. Ikpeazu as governor after the court found him guilty by of tax evasion. Mr. Abang had, in that judgment, directed the Independent National Electoral Commission (INEC) to issue certificate of return to Mr. Ogah who came second in the primaries conducted by the Peoples Democratic Party in the state. In a swift reaction to the judgment, Mr. Ikpeazu filed an appeal before the Appeal Court in Abuja. 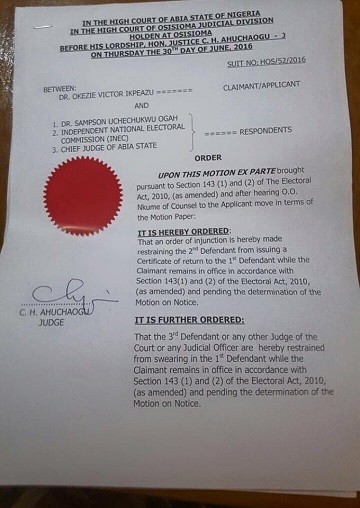 He also filed a motion for stay of execution of the judgment at the Federal High Court. However in compliance with the court order, INEC issued Mr. Ogah a certificate of return on June 30, and he (Mr. Ogah) immediately headed to Abia to be sworn in as governor. But an Abia State High Court hurriedly issued an injunction stopping the state’s chief judge or any other judicial official in the state from administering the oath of office on Mr. Ogah, pending the determination of the motion on notice at the Court of Appeal. “Upon this motion ex-parte pursuant to section 143 (1) & (2) of the Electoral Act 2010 (as amended) and pending the determination of the motion on notice, after hearing O.O Nkume, counsel to the applicant,” Justice Chibuzo Ahuchaogu said. “It is ordered that an order of injunction is hereby made restraining the 2nd defendant (INEC) from issuing a certificate of return to the 1st defendant (Ogah) while the claimant (Ikpeazu) remains in office in accordance with section 143 (1) & (2) of the Electoral Act 2010 (as amended) and pending the determination of the motion on notice. The state has, consequently, remained without a clear leadership since Thursday. 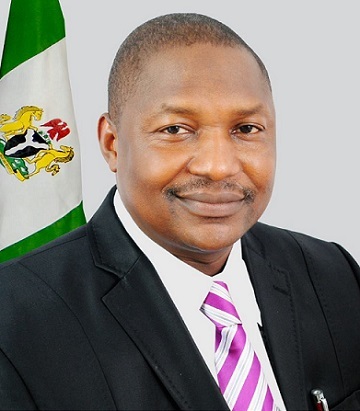 Angered at rumours making the round that he is behind the legal logjam at the Abia State of the governorship seat, the Minister of Justice and the Attorney General of the Federation, Mr Abubakar Malami has ordered both parties involved to awaits the decision of the court. Mr. Malami through in a statement issues and signed by his Special Adviser on Media and Publicity, Mr. COMRADE SALIHU OTHMAN ISAH, express his dissatisfaction for dragging him to the Abia State conundrum. He particular accused some session of the media for supporting and helping peddle what he described as " the insinuations and crass lies". "The attention of the Office of the Honourable Attorney General of the Federation and Minister of Justice has been drawn to the insinuations and crass lies being peddled and disseminated by a cross-section of Nigerians and the various media platforms that the Honourable Attorney General of the Federation is behind the legal logjam over the Abia state governorship seat and wish to clarify that those canvassing this position have no basis to do so." "Of particular concern are those who have peddled ill-natured rumours with a view to misinform our discerning populace that the Honourable Attorney General of the Federation and by extension, the Federal Government of Nigeria that gave directives to the Independent National Electoral Commission (INEC) to issue Certificate of Return to Dr. Uchechukwu Ogah declaring him Governor-Elect. He has definitely not taken any action either by spoken words or body language as far as this Abia governorship crisis is concerned." "I wish to therefore, on behalf of my principal declare that these rumours are untrue and a figment of the imagination of those pushing these selfish, shameless and irredeemable lies into public space which only translates to partisanship on the side of its purveyors." "As far as the Honourable Attorney General of the Federation is concerned, the constitutional powers for the legal opinion of his office have not been invoked on this issue. So far, nobody has approached him to proffer any legal opinion to it. As a strong believer in the rule of law, it is his belief that the law should naturally take its cause. The Honourable Attorney General of the Federation will not be dragged into this controversy and mind-games being played out by the various legal minds and spin doctors of both camps at this point." "The parties involved should await the decision of the courts." "In fact, we wish to by this statement advice those in the habit of dragging the highly esteemed Office of the Honourable Attorney General of the Federation and Minister of Justice into knotty issue of this kind even when it is yet to take a position. They should desist from these unwarranted presumptions henceforth." Mr. Ogah had challenged the emergence of the state governor, Okezie Ikpeazu, as the winner of the Peoples Democratic Party’s ticket in the gubernatorial primaries held in December 2014. Mr. Ogah said Mr. Ikpeazu had defaulted on his taxes, adding that he submitted fraudulent tax documents to qualify as a candidate in the primaries. In a verdict delivered by Abang Okon, the FHC in Abuja found Mr. Ikpeazu guilty of the charges and ordered INEC to issue a certificate of return to Mr. Ogah to pave way for his swearing-in. Mr. Ikpeazu appealed the judgment and notified INEC of the development. But the electoral umpire went ahead to execute the order of the court, saying it never received any notice of appeal from Mr. Ikpeazu. Soon as he was in receipt of his certificate of return, Mr. Ogah embarked on a journey to Umuahia, the state capital, to prepare grounds for his swearing-in on Friday. But while on his way, Mr. Ogah received notifications that Mr. Ikpeazu had secured an injunction from an Abia State high court stopping the Chief Judge of the State, the President of the Customary Court of Appeal and any other judicial officer from swearing in Mr. Ogah as governor. Mr. Ikpeazu also declared a public holiday for Friday and Monday. Tuesday and Wednesday had already been declared public holidays by the federal government. Mr. Ogah’s efforts to get sworn-in as governor on Friday morning was thwarted by the absence of the state’s Chief Judge, Theresa Uzoukwu. Also on Friday morning, INEC finally acknowleged it is in possession of a notice of appeal from Mr. Ikpeazu, but said it did not include a notice of stay-of-execution order from the court. The uncertainties prompted the police to intensify security activities across the state, its spokesperson said. Don Awunah, the newly-appointed Force Public Relations Officer, said the police were on the ground to ensure that a peaceful atmosphere is maintained. The judicial abracadabra beclouding the Abia State governorship seat seem to have had no head as at press time. The Nigeria Police Force on Friday said it was monitoring events in Abia State, where a political leadership crisis in unfolding, threatening the peace of the state. The assurance came amid concerns of a potential breakdown of law and order that may arise as a result of INEC’s decision to issue the certificate of return to oil and gas executive, Sampson Ogah, in compliance with a Federal High Court ruling on Monday. Pandemonium may ensue in Abia State should the relevant authorities refuse to wade in and solve the legal puzzles currently taking over the politics of the state as two members of the Peoples Democratic Party are laying claim to a governor's seat. Mr. Uche Ogar has insisted that he is the rightful governor of Abia state and has to be sworn-in in obedience to the ruling of the Abuja High court. Ogar in a statement by his Media Adviser, Monday Ubani, stated that the ruling by the Abia state high court stopping his swearing in is subordinate to that of the Abuja court, and hence cannot hold. Ogar also stated that he was on his way to Abia state to be sworn in. 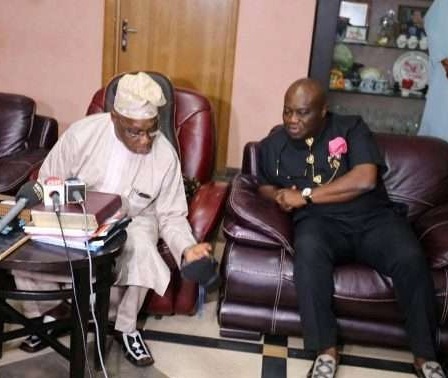 This is likely to create a faceoff, between his tam and that of Governor Okezie Ikpeazu who has also insisted that he remains the governor of the state, based on the ruling of the state high court. The statement from Ogar reads: “The Federal high court of Abuja presided over by Justice Okon Abang ordered Dr Okezie Ikpeazu to vacate his seat for Dr Uche Ogah OON as the rightful person for the seat. INEC was ordered to issue the said Ogah with a certificate of return which that body has complied with”. “The next order that was issued by the federal high court was for the Chief Judge of Abia to swear in Dr Uche Ogah, the rightful person to occupy the governor’s seat. That order is yet to be complied with”. “I understand that a high court in Osisioma Ngwa the axis where the governor hails from has issued an interim order restraining the Chief Judge from swearing in Dr Uche Ogah as the governor of the State. The point must be made that this order cannot stand as it is invalid in law”. “The order did not emanate from a higher court but from a court of coordinate jurisdiction and does not in any vitiate or invalidate the earlier judgement of the Federal High Court in which the Chief Judge of Abia State was ordered to swear in Dr Uche Sampson Ogah. Only a higher court, in this case Court of Appeal has the jurisdiction to reverse the judgement of the Federal High Court”. Speaking through another aide, Peter Agba Kalu, Mr. Ogah said he was on his way to Umuahia, the Abia State capital for swearing in. He said, “We are en route to Umuahia for the swearing in from Imo Airport. “We don’t believe there is an injunction like that. The injunction is baseless and against the rules of the judiciary”. “Is the injunction saying that the Certificate of return issued to Uche Ogah is not legal. Is it saying that Abia should not have a Governor because the Certificate of return nollifies that issued to Ikpeazu”, the statement read. Meanwhile, As soon as INEC’s issuance of the Certificate of Return to Ogah was announced, Gov­ernor Okezie Ikpeazu rushed to the law courts to obtain an ex- parte order restraining the Chief Judge or any other judge of the court or any judicial of­ficer of the state from swearing-in Ogah as the new governor of the state. And after receiving his cer­tificate from INEC, Ogah took a chartered flight from Abuja to Umuahia, the state capital, for the oath-taking ceremony. He, how­ever, ended up in Owerri, the Imo State capital, where he un­veiled his governance blueprint for the state. Ikpeazu also rose to the chal­lenge, when he appealed to the people to remain calm and as­sured them that the matter would be resolved by the courts. Ikpeazu had, through his counsel, Mr. O. O. Nkume, filed an ex parte motion seeking an order of the court to stop Ogah from being sworn in as the Gov­ernor of the state. The defendants in the motion are: Ogah (first defendant), INEC (second defendant) and the Abia State Chief Judge (third defend­ant). As the confusion and politi­cal tension in the state threatened to boil over into unrests, Ikpeazu appealed to the people to remain calm in spite of the unsavoury de­velopments. He insisted that he was still in charge. In a press statement by his Chief Press Secretary, Enyin­naya Apollos, the governor ex­pressed surprise over INEC’s ac­tion despite his notice of appeal against the Justice Okon Abang’s judgement that ordered him to vacate office. He said: “I have received, with concern, reports of the purported issuance of certificate of return to Mr. Uche Ogah by INEC as governor of Abia State, despite the pendency of a notice of appeal and motion for stay of the orders made by Justice Okon Abang of the Federal High Court, Abuja. “Our laws are clear on this matter. No one may be issued with a certificate of return, let alone be sworn in as governor when there is a subsisting appeal and application for stay. “I want to appeal to Abians to remain calm and law-abiding in the face of this provocation, un­less and until the appellant courts have conclusively resolved the appeal; the status remains, I am still the governor of Abia State,” he said. Confusion has rented the air in Abia State as the situation in the state suggests there are currently two governors. Following the Sack of Dr .Okezie Ikpeazu, over alleged tax evasion by Federal High Court in Abuja and ordering the Independent National Electoral Commission, INEC, to immediately issue Dr Samson Uche Ogah with certificate of return, the INEC, on Thursday complied by issuing certificate of return to Ogah, of the Peoples Democratic Party, PDP, as the new governor of Abia state despite appeal filed by Ikpeazu and another court order that barred new governor from being sworn in. The Justice Okon Abang-led court had held that Ikpeazu submitted false tax information to his party, the PDP during the governorship primary in December 2014, and as such was not qualified to contest for the party’s primaries. Justice Abang also ordered INEC to immediately issue a certificate of return to Ogah, while ordering Ikpeazu to immediately vacate the office of the governor. 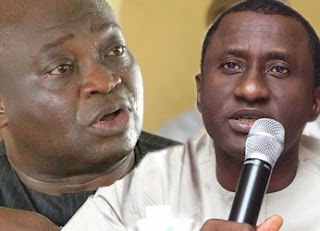 Embattled Abia State Governor, Dr Okezie Ikpeazu, has reacted to the issuance of Certificate of Return to Mr. Uche Ogah by the Independent National Electoral Commission (INEC), as governor of Abia State. A statement he personally signed on Thursday said it was said that INEC carried out the issuance, “despite dependency of a notice of appeal and motion on stay of the orders made by Justice Okon Abang of the Federal High Court, Abuja”. He added that, “Our laws are clear on this matter. No one may be issued with a certificate of return let alone be sworn in as governor, when there is a subsisting appeal and application for stay. The Independent National Electoral Commission, INEC, has explained why the first runner up in the 2014 Peoples Democratic Party, PDP, gubernatorial primary election in Abia State, Uche Ogah was issued with Certificate of Return on Thursday. An Abuja Federal High Court had on Monday annulled the election of Abia State Governor, Okezie Ikpeazu for alleged tax evasion and also ordered INEC to issue Ogah with Certificate of Return. Explaining why Ogah was issued with the Certificate of Return, INEC’s National Commissioner, in charge of the South East, Amb. Lawrence Nwuruku said the commission only heeded to a Federal High Court order. Nwuruku stated that he could go to jail if he acted otherwise, stressing that if the valid court order was later reversed, INEC would not hesitate to act accordingly. He said, “The situation is that we are simply obeying the court order. The court said with immediate effect, without wasting time, we should issue him Certificate of Return and that is what we have done – to obey the court order. If the court tomorrow issues another order, we would obey the same. By the grace of God, I am the INEC Commissioner in charge of South East. “If court says we should issue the same certificate to another person, I will do same. In this case, court ordered us to issue a Certificate of Return to the person who won the election and that is Uche Ogah. The Independent National Electoral Commission, INEC today issued a certificate of return to Mr. Uche Ogar who was declared the winner by the court three days ago. In reaction to why INEC took the decision despite an appeal filed by the incumbent, Dr .Okezie Ikpeazu, the National Commissioner in charge of the South East, Amb. Lawrence Nwuruku said the commission only kowtowed to the lawful order of a court. Nwuruku added that as a citizen, he could go to jail if he flouts a valid court order. “The situation is that we are simply obeying the court order. The court said with immediate effect without wasting of time, we should issue him Certificate of Return and that is what we have done – to obey the court order. If the court tomorrow issues another order, we would obey the same. By the grace of God, I am the INEC Commissioner in charge of South East. I’ll do the same thing if the court orders us to do so. Meanwhile, another high court sitting at Abia has given order to the Commissioner of Justice of the State not to swear in Mr. Ogah as the new governor. A federal High Court sitting in Abuja has sacked Dr .Okezie Ikpeazu ordering him to vacate his office as governor with immediate effect. The order was on the ground of an allegation that Ikpeazu submitted fabricated information to his party, the Peoples Democratic Party (PDP) for the party’s governorship primary in December 2014. In his ruling, Justice Okon Abang on Monday June 27, ordered the Independent National Electoral Commission, (INEC) to immediately issue a certificate of return to the complainant, Dr Samson Uche Ogah asking that the commission should cease the certificate of return issued to Governor Ikpeazu since he was never qualified to run for the party primaries as a governorship candidate. 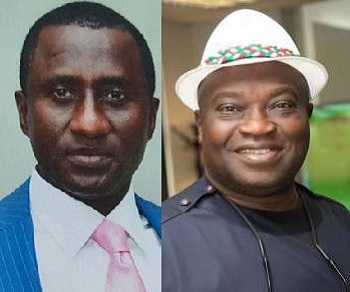 The judge also mandated the Chief Judge of the state to swear in, Uche Ogah, his opponent who was one of the party’s aspirants in the said election and polled the second highest number of votes in the primary. It was learnt that Ikpeazu was sacked from his office over fake tax returns during the PDP primaries. Meanwhile, the sacked governor, speaking through his media office, says he will appeal the ruling as he had instructed his lawyers to immediately file an appeal against the said judgment. He urged the citizens of the state to remain calm, noting that he had faith in the judiciary. 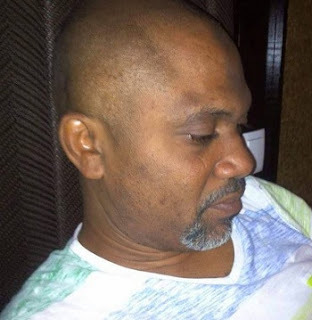 On the allegation that he evaded paying taxes, he noted that he was duly issued with his tax receipts in 2014, having been an appointee of Abia State Government from 2011 to 2014, when he served as the General Manager, Abia State Passengers Integrated Manifest and Safety Scheme, ASPIMSS, and first Deputy General Manager, Abia State Environmental Protection Agency, ASEPA, Aba and environs, before his resignation in October 2014 to contest the governorship election. He added that, being a civil servant, his taxes had always been deducted at source by the Abia State Board of Internal Revenue. He maintained that he remains the Governor of the state according to law until the final determination of the matter by the appellate courts.